Fusion serves home-cooked Organic seasonal and local food. Our base menu changes quarterly, and many items such as specials and salads change daily. 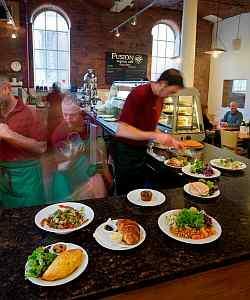 Our food is cooked with care by our enthusiastic team in an open-plan kitchen. We believe in creating food that is fresh, healthy and above all tasty, presented with a touch of restaurant flair. In the day we take a down-to-earth and dedicated approach to bring you a diverse and ever-changing range of fresh, seasonal and tasty snacks and meals, carefully prepared and served promptly at very good value. We do not use a microwave. In the evening we change attire and style to bring you world-flavoured Fusion dining. We tailor make and deliver an endless choice of menus, from 3 courses to canapés, influenced by what is local and in season. Our culinary influences are diverse, fusing local produce with worldwide styles and flavours, bringing you specials and other dishes that you wont see anywhere else. We are delighted to annouce that from January 2012 the Fusion Organic Cafe will now be open every Thursday and Friday evening with the launch of the Fusion Organic Bistro. Open every Thursday and Friday from 6-10pm (taking orders 6-8pm), we will be serving you a seasonal 2 or 3 course menu showcasing our wonderful Organic and/or Local ingredients. If you are coming straight from work, from 6-7pm only, we can offer you an early bird 1 course menu of daily special option. "The benefits are first and foremost to you, as these are better value and higher quality products. The farmers or producers and their community and employees get a boost. "The surrounding environment is conserved and regenerated due to sustainable practices. "There's a lower carbon footprint as there's less food miles and reduced packaging. "By supporting these small scale enterprises we help maintain the diversity and continuity of artisan techniques and methods. Our star product is our exclusive coffee, Biodynamically produced and directly traded from Brazil. It is a single origin 100% arabica bean of very high quality, with a round smooth chocolaty flavour and a very nice kick to wake up your day! When available our lamb and sometimes pork, comes from our very own farm at Eyam. 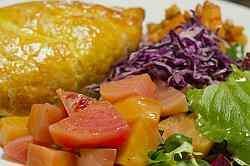 Our chicken is local and free range, from Pogg Lane produce. Most of our seasonal vegetables come from the North East, our fish is sustainably fished off the North East and Scottish coasts and our dry products come from Lembas, Sheffield's local whole foods co-operative. Fusion serves home-cooked Organic seasonal and local food. Our base menu changes quarterly, and many items such as specials and salads change daily. New Bistro nights from January 2012 every Thursday and Friday. Accessible by Public Transport: Sheffield station is 0 miles away.